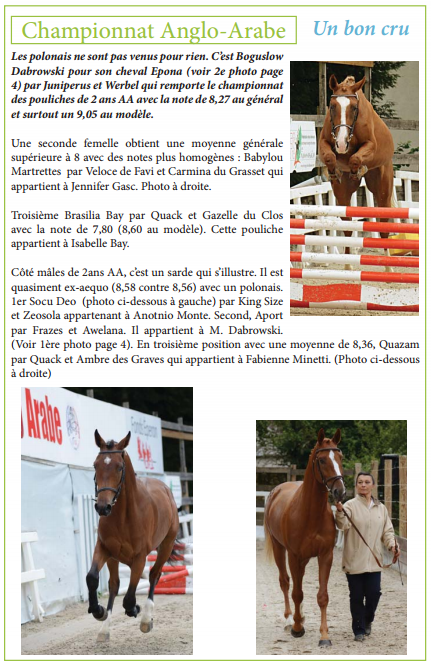 Socu Deo, 2 years old Sardinian Anglo-Arabe, won the international breeding competition “Grande Semain de Pompadour 2013” that has been held in Pompadour (FR) last September. The international breeding meeting is very prestigious and awaited by breeders, owners and potential sellers, giving the possibility to bet on the future wordly champion horses. The breeder Antonio Monte and all the Sardinian team (coordinated by AGRIS regional agency) have to be very proud of the result, confirming the high quality products of breeding in our small region. Socu Deo (from King SIze and Zeosola) beat Aport, Polish Anglo-Arabe, and Quazam, French Anglo Arabe. Keep your eyes on young horses in Sardinia, you will have good surprises!